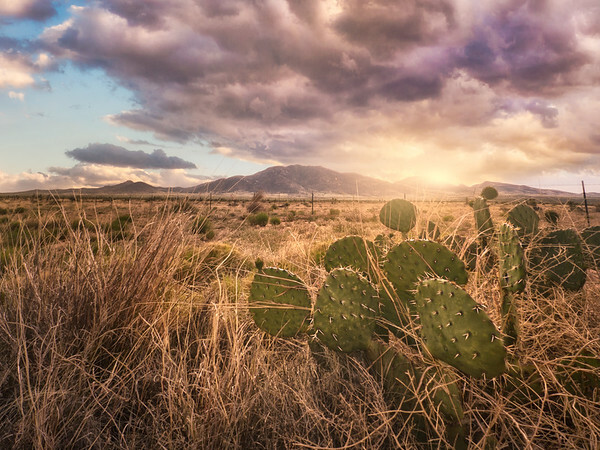 A collection of images that feature flowers, trees, and other plant life of New Mexico, the Southwest, and more. 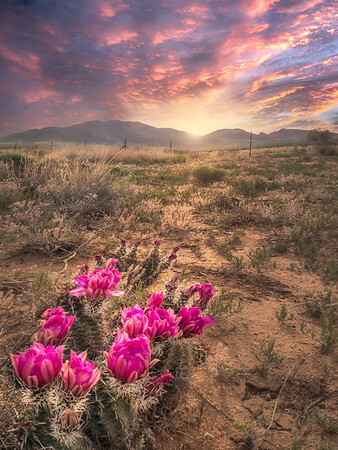 Sunrise peeks over Gold Hill of the Burro Mountains, casting soft light on flowering cacti. 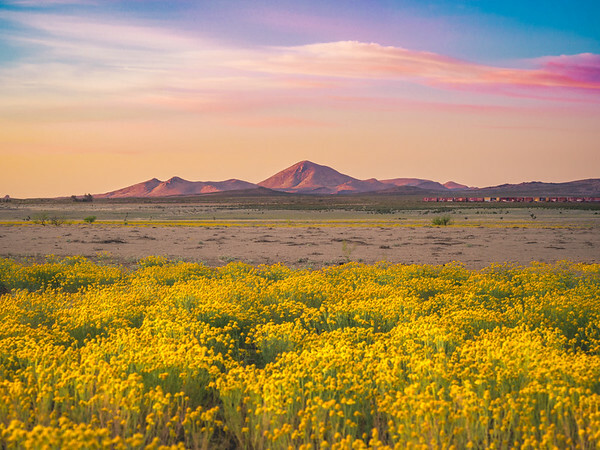 The Pyramid Mountains and a train during sunrise amongst wildflowers in Lordsburg, New Mexico. 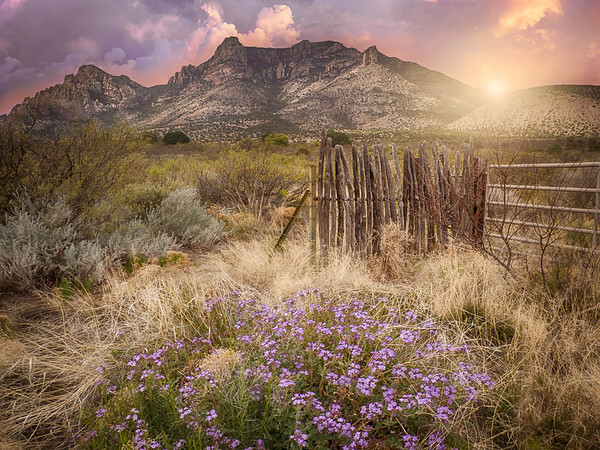 Purple skies and purple flowers in Portal, Arizona. 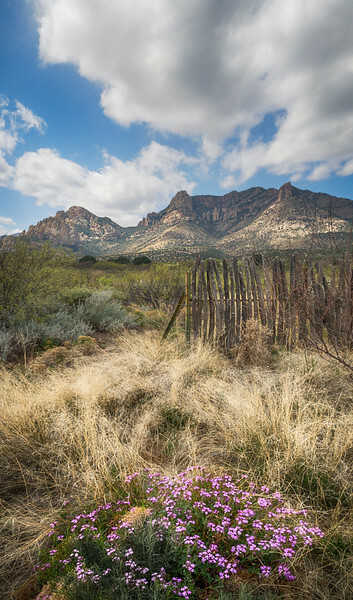 A two-image panorama of flowers blooming in front of a rustic fence, with the Chiricahua Mountains as a backdrop in Portal, Arizona. 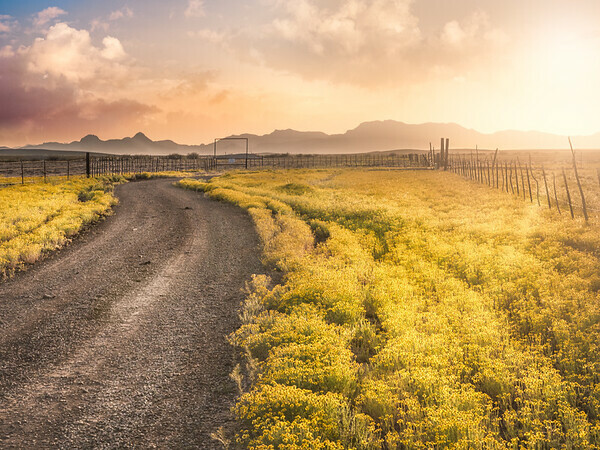 Wildflowers line a country road in front of the Peloncillo Mountains in Lordsburg, New Mexico. 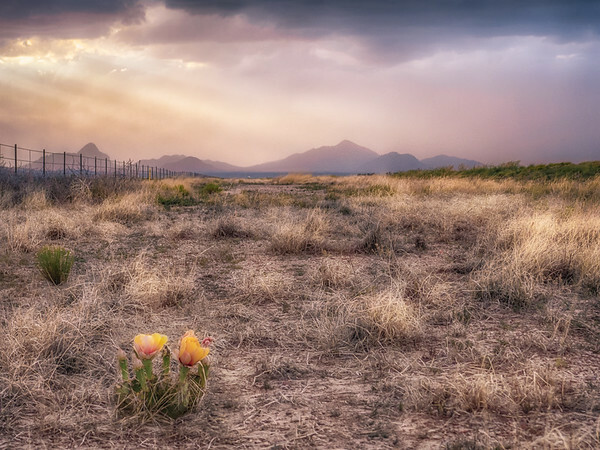 A lone flowering cactus sits before a beautiful, hazy backdrop near Animas, New Mexico. Sunrise over the Burro Mountain's Gold Hill near Lordsburg, New Mexico. 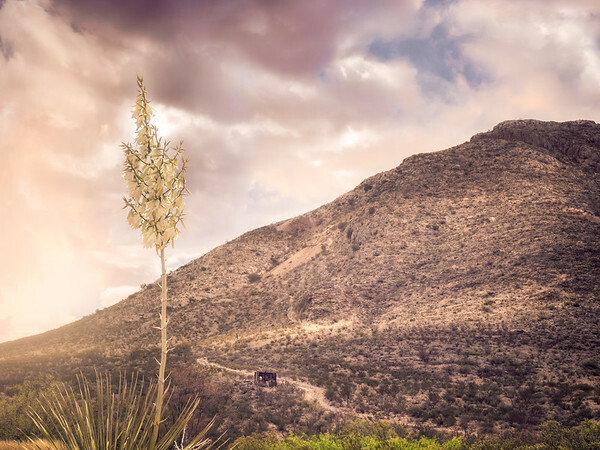 Remnants of a mining camp can be seen behind a flowering yucca at Granite Gap in Hidalgo County, New Mexico. 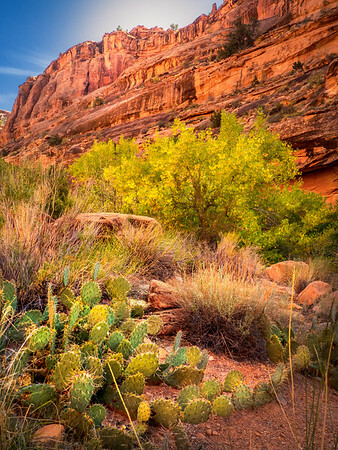 Autum foliage and cacti in Hunter Canyon in Moab, Utah. 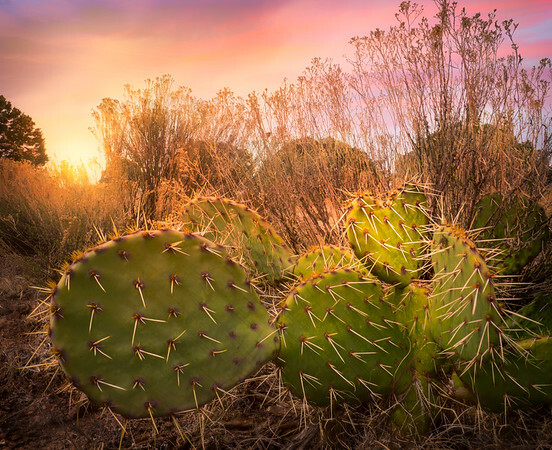 A Prickly Pear cactus is bathed in golden light during sunset outside Lordsburg, New Mexico. 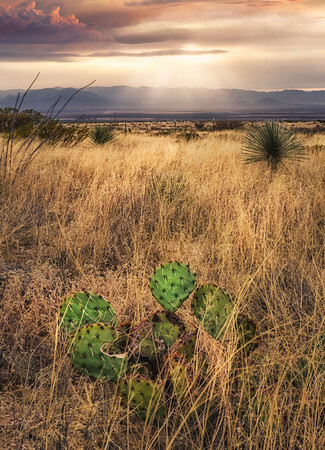 Rays shine down on the Chiricahua mountains and tall grasses surrounding a desert cactus in Hidalgo County, New Mexico near Granite Gap. Along the Devil's Garden Trail at Arches National Park in Moab, Utah. 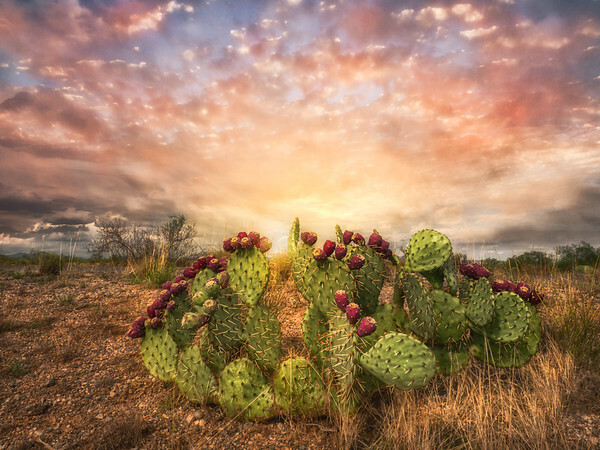 A prickly pear cactus with a heart-shaped pad basks in the sunset's glow. 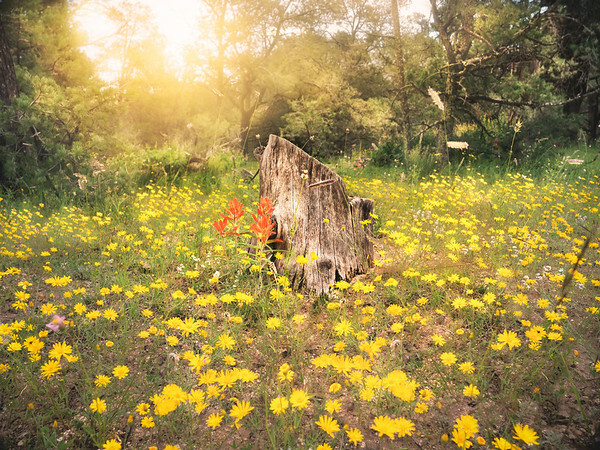 The Gila National Forest explodes with end of summer florals in Grant County, New Mexico. 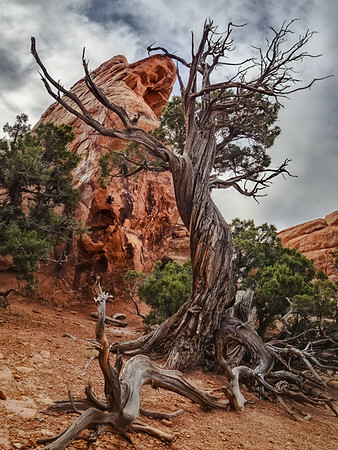 A tree amongst the Utah Desert in Devil's Garden of Arches National Park, in Moab. 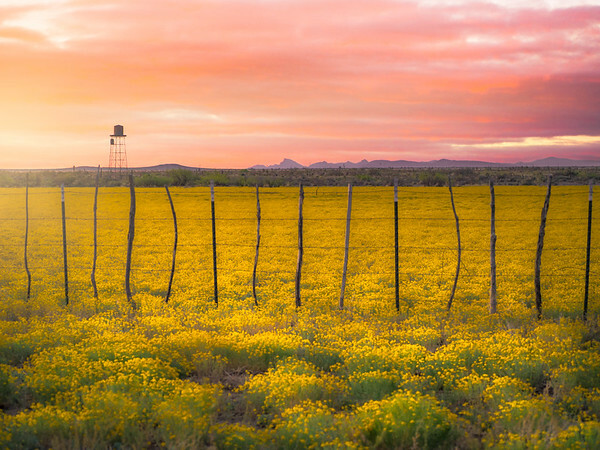 A medley of colors come together during this spring sunset in Lordsburg, New Mexico. 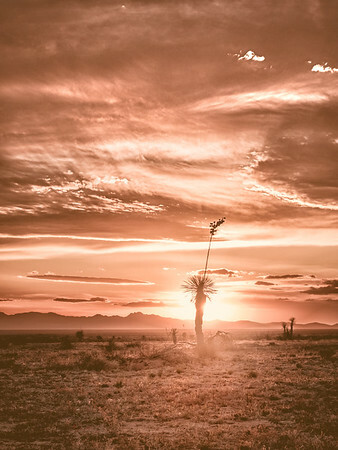 Sunset casts a golden glow on a yucca cluster near Lordsburg, New Mexico. 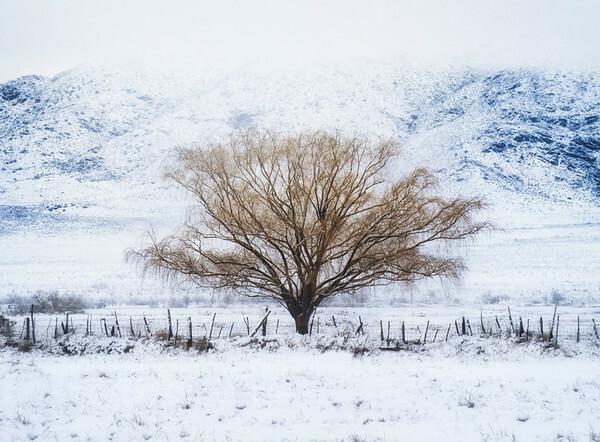 A tree stands proudly amongst the snow in the Burro Mountains in White Signal, New Mexico. Note: Sadly, this tree has since been cut down, never to be photographed again. 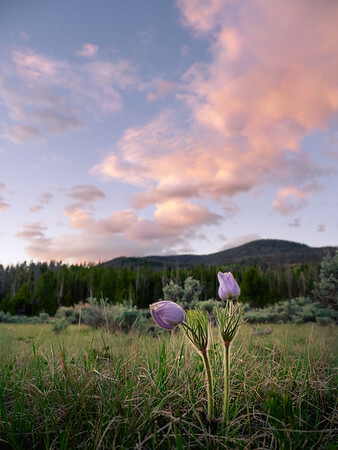 Pasqueflowers with closed petals stand poignantly during sunset in Rocky Mountain National Park in Colorado. 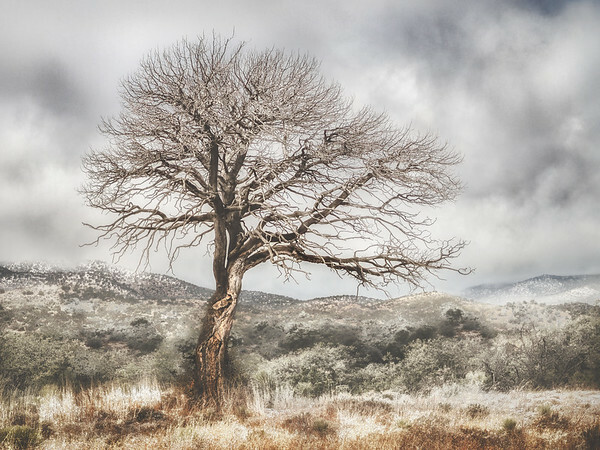 A bare branched tree stands in a patch of flowers before a misty peak in White Signal, new Mexico. Note: Sadly, a few months after this capture was taken, someone cut down this beautiful tree. 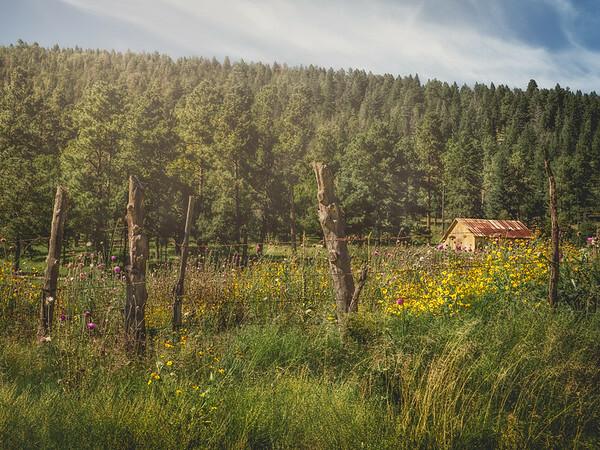 A barn tucked away behind a floral scene between Cloudcroft and Ruidoso, New Mexico. 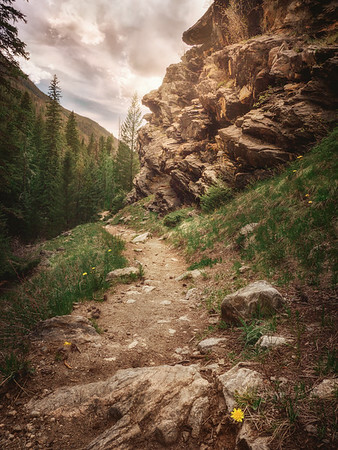 A hiking trail is dotted with dandelions during the spring in Rocky Mountain National Park near Grand Lake, Colorado. 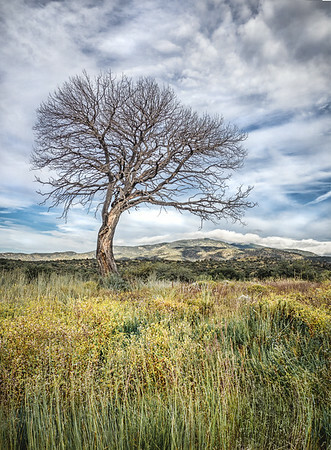 A winter tree and rustic wooden fence sit before the snow-coated Burro Mountains in Hidalgo County, New Mexico. 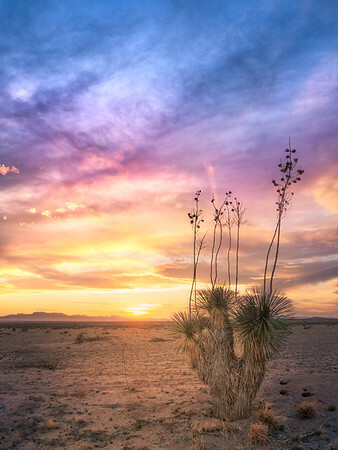 The branches at the base of this yucca silhouetted by the sunset mimic spread wings. 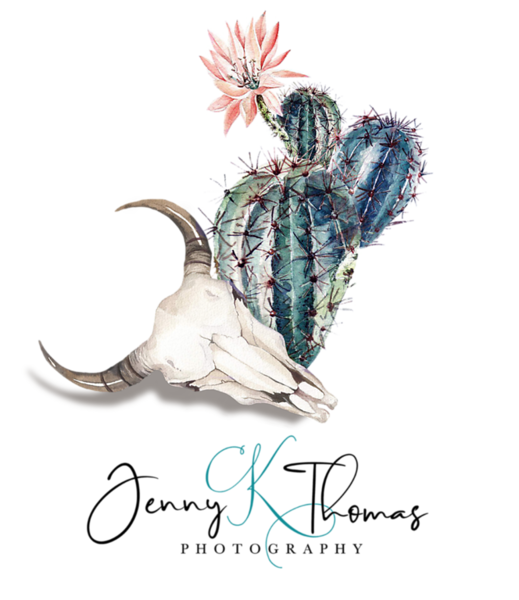 Taken near Lordsburg, New Mexico.